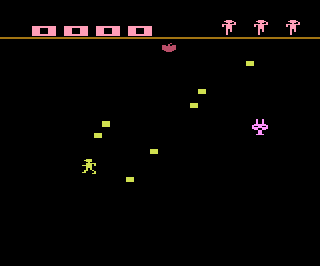 Not to be confused with the Milton Bradley pseudo 3-D space shooter of the same name, this Survival Run is a strange action game featuring an odd looking man running around a screen trying to collect blocks while avoiding an equally odd looking alien. When this prototype surfaced in a lot of EPROM chips in early 2004, no one was quite sure what to make of it. Obviously it had nothing to do with Milton Bradley game, but yet no one could match it up with the description from any unreleased game. Finally through some careful research it was determined that this prototype was actually an unreleased game by Data Age. Survival Run can best be described as a weird cross between Pac-Man and a platform game. According to an advertisement, you have entered the 'deadly cosmic portal' (why on earth would you enter something labeled DEADLY?) and have been plunged into a negative universe full of deadly ammonia and narrow walkways that span a liquid nitrogen sea (seriously, who designed this world?). Your only hope for survival is to grab Korbinian cubes that will neutralize the air while avoiding the 'diabolical Dylak'. 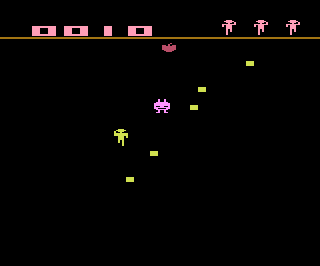 The game itself seems very incomplete but is fairly playable. There are two different action screens that repeat over and over until the player loses all his lives. There is also a sort of weird victory screen that can best be summed up as 'creepy'. This screen is the most difficult of the two. Here you must run up and down six different walkways that are floating over a deadly ocean of liquid nitrogen (wouldn't you freeze to death just by standing too close?). Randomly placed on the walkways are yellow squares called Korbinian cubes which the player must collect. 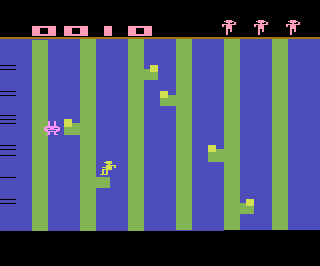 To get to the other walkways the player must carefully jump from the little platforms that appear on the sides of the walkways. Jumping over the ocean is rather difficult as you must hold down the button first THEN push left or right. This leads to a lot of unintentional and frustrating deaths. On an amusing side note, it appears that your character is wearing a top hat when he dies due to the blocky graphics (I think those are supposed to be ears). Of course it wouldn't be much of a game without something to make your task a bit more difficult, something like say... an alien! Yes that right, Survival Run has its very own alien called the Dylak. Unfortunately for you, this alien isn't one of those cute E.T. guys, this one is out to eat you! Making your life truly miserable is the fact that the Dylak can walk on water. That's right, this little bugger has free reign of the entire screen. While avoiding the Dylak is difficult, it is possible with a little luck. Once all the cubes have been collected, you can exit to the next screen by moving to the top of one of the walkways. Another interesting fact about this screen is that it appears that the programmer was playing around with a primitive ripple effect. 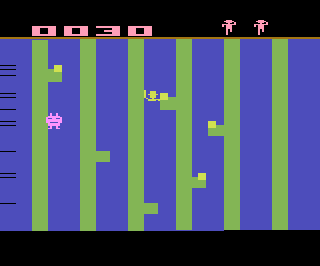 As you move around the screen the graphics will occasionally appear to become stretched in certain spots, only to go back to normal a few moves later. At first this was thought to be a programming glitch, but now it looks more and more like this was intentional. This effect is not present on the second screen. This is the strangest screen of the three. According to the advertisement, by collecting all the Korbinian cubes you achieve super strength and can push the Dylak into the deadly sea (which probably won't do much good considering he can walk all over it on the first screen). However as this version is incomplete, once you touch the red blob it will turn into a large copy of the player (maybe this is your super charged self?) and several people will appear on the screen while some victory music plays (sorry, no Dylak style revenge). It is unknown what this screen is supposed to represent, but it is most likely just a placeholder for the unfinished ending or an early idea that was scrapped before the advertisement was made. Due to the incomplete nature of this prototype it isn't fair to pass judgment on it. However if it was to remain true to form for Data Age, the end result probably wouldn't have been much better. It is unknown why Data Age stopped development on Survival Run, but it may have been due to the game not shaping up as well as they had hoped. While it may not be the best unreleased game out there, Survival Run is still an interesting footnote in prototype history. 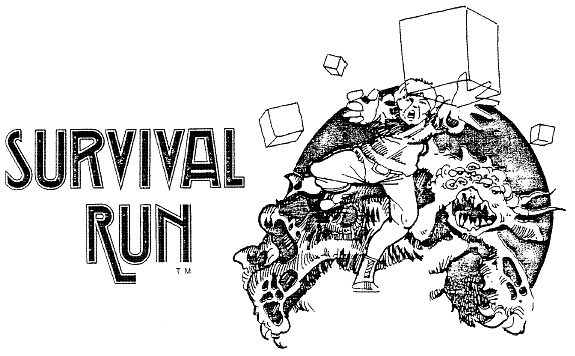 An brief advertisement was shown for Survival Run in some magazines.